IT TICKLES Jim Jefferies and presumably amuses Faissal El Bakhtaoui himself to hear people wondering who Dunfermline’s terrific new summer signing is. With 11 goals to date, El Bakhtaoui is Scotland’s top goalscorer. He is also Scottish football’s hottest property. The goal that rounded off their deserved 3-1 win over Premiership Dundee on Tuesday night meant he drew one clear of Rory McAllister, Peterhead’s scoring phenomenon. McAllister is on “only” ten, despite scoring five in one match recently against Falkirk. So El Bakhtaoui deserves to be the talk of places other than just the Halbeath Road. His story should also be better known since he is not high-flying Dunfermline’s new signing. Far from it, in fact. He scored nine goals for the East End Park side last season, four the season before. These figures, suggesting gradual improvement, support El Bakhtaoui’s own startling admission, made after his latest double helped dump Dundee out of the League Cup, that he has only recently learned how to play the game. He was asked over for a trial in the summer of 2012 by Jim Jefferies, the club’s then manager. Considering the place from which El Bakhtaoui was invited to Fife happened to be St Tropez, where the French Moroccan player’s family is based, Jefferies was not confident the offer would be accepted. But El Bakhtaoui came and made his debut for the club three years ago, in Berwick of all places. His sense of dislocation was surely only heightened when he made his next appearance, this time in Lochgelly. Although the player showed enough flashes to give his manager the gut instinct he was on to something, Jefferies still admits offering him a permanent contract required a huge leap of faith. Jefferies remembers the looks from several Dunfermline directors which told him they thought he had lost his mind. After all, El Bakhtaoui, for all his promise, had barely played 11-a-side football before. He was more accustomed to futsal, a variant of association football that is mostly played indoors, with a smaller ball. At first he struggled. “It’s a big pitch, a big ball – and there are big defenders,” said El Bakhtaoui on Tuesday night. It was also a huge cultural change for El Bakhtaoui, now 22. Initially, he was placed in lodgings in Edinburgh rather than Dunfermline, with two other foreign trialists. Only 19 years old and left to his own devices in the big city, he failed to settle. Or perhaps he settled too well. Jefferies decided to relocate him in Dunfermline, where he stayed with fellow team-mates, including Callum Morris, now at Dundee United. “Each year that went by, the jury was always out,” recalls Jefferies. “But I told them, ‘you have to give him time’. He scored on his full debut at Stenhousemuir but there was always the question about whether he could handle the rigours of Scottish football. He was doing reasonably well a couple of seasons ago so we gave him a longer-term contract. One Premiership club at the time was keeping an eye on him. Jefferies remembers having the same “little feeling” with others such as Steven Naismith, whom he knew would be something special when watching him play at Brechin for Kilmarnock. Falling into the same category are Colin Cameron and Craig Bryson, whom he scouted at Raith and Clyde respectively, before recruiting them for Hearts and Kilmarnock. But Cameron and Bryson were already becoming well established. Even Naismith was at least a product of several years in the Kilmarnock youth teams. El Bakhtaoui, meanwhile, had only very limited experience of formal 11-a-side football. It really was a leap of faith. “He has great pace and really good feet and for someone so slight, he is one of those players who is solid when he shields the ball,” says Jefferies. “But you are right, he was different from those others I mentioned. I’d seen the rest play, with this one I hadn’t. But I could sense in training he was something different. Jefferies recalls the time when it really became apparent that El Bakhtaoui was beginning to shake off those less useful futsal habits and adapt to Scottish football. It brings a whole new meaning to doing it on a wet Tuesday night in Stoke. This was a Wednesday night in Stranraer. It might well have been wet, Jefferies cannot now recall. 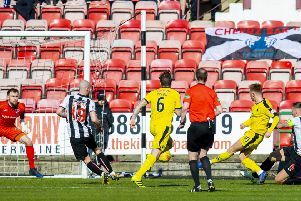 But he does remember El Bakhtaoui scoring Dunfermline’s equaliser in an eventual 2-1 play-off defeat. They managed to turn round the deficit in the second leg, thanks to the contribution of another goal by the gifted El Bakhtaoui. “He gave them a torrid time,” says Jefferies. Dunfermline – and Jefferies – were justifiably rather proud of their secret. But now the secret is out, the fans wonder how long they can hold on to their exciting little magician.